Although many gemstones can be very durable, they are natural substances and should be treated accordingly. Some gemstones also need some special care. Following a few general rules will make sure that they will continue to look like the day you bought them. Diamonds are very hard but even they can shatter with a single well-placed blow. They can be vulnerable to breakage if it has inclusions that weaken the crystalline structure. Rubies and sapphires are some of the toughest gemstones but even they can chip if hit sharply. Exercise common sense! If you have a ring set with a softer gem variety or an included stone, take it off before you do anything where you have a chance of bumping the stone. When buying the ring to wear everyday, make sure that it contains a gemstone that is hard enough not to break or wear down too quickly. Consult your jeweler to find out more. Generally all rings should be taken off before activities such as strenuous exercise, gardening or dish washing. Think twice before putting gems in an ultrasonic cleaner. Diamonds, rubies and sapphires will mostly be fine, but many other gems may not be: when in doubt, leave it out of consult your jeweler. Diamonds, rubies and sapphires, and other single-crystal gems can generally be cleaned in this way. Just add a touch of ammonia in the water of the ultrasonic cleaner. It will shake loose and remove all build up and will bring back the sparkle of the stone. Opaque gemstones like Lapis Lazuli, turquoise, malachite, require extra special care. Never use an ultrasonic cleaner and never use ammonia or any chemical solution. These gem materials should just be wiped clean gently with a moist cloth. These gemstones can be porous and may absorb chemicals, even soap that may build up inside the stone and discolor it. The reason why these materials need more care than transparent gemstones is that they are essentially rocks, not crystals made from a single mineral. A single crystal gem like sapphire will not absorb water. All the molecules are lined up so tightly in the crystal that there is no room for water to enter. Opals also require special care. Never use an ultrasonic, never use ammonia, and avoid heat and strong light, which can dry out the natural moisture in opals. Organic gems like pearls, coral, and amber should only be wiped clean with a moist cloth. Due to their organic nature, these gems are both soft and porous. Be careful with the chemicals contained in hairspray, cosmetics, or perfume: they can, over time, damage pearls in particular. Store each piece of gemstone jewelry separately so that harder stones don’t scratch softer ones. Almost every gemstone is much harder than the metal it is set in. Gems can scratch the finish of you other jewellery if you throw your jewelry together indiscriminately in a drawer or jewelry box. The mystique of pearls is locked up, not only in their exquisite beauty, but also in the spiritual value given to them by many factions of religious and devout thought. The exotic quality associated with pearls result from the unique way in which they are formed in nature as well as the foreign destinations from where they mostly originate. It is said that the East first introduced gem quality pearls to the West during the Hellenistic period. Before this, pearls were for example also found in the Mediterranean and in the seas near Britannia, but these pearls where all small and discolored and of not nearly the same appeal as those coming from India, the Persian gulf and Sri Lanka. By this time pearl divers in the Persian gulf were quite accomplished and skilled in their task of extracting pearls from pearl bearing oysters. Pearls were therefore seen as one of the many marvels coming from the Eastern world. The need, which originated in the West for many such Eastern products, opened the Trade route between the East and the West. Many famous kings and queens, who reigned throughout history, have adorned themselves with pearls. An example of such royalty was Queen Elizabeth I, which was passionate about these natural gems. It is also told that at the height of the Egyptian and Roman empires, Cleopatra invited Mark Anthony to an evening of entertainment whereat he drank a glass of wine wherein one of her priceless pearl earrings where dissolved. Today pearls are associated with elegance, femininity and timeless classic style. They are especially related to bridal costume and to the symbolism that is coupled with weddings. It is known as June’ s birthstone and is also given as a gift at 30th wedding anniversaries. Pearls form as a result of a rare culmination of circumstances. In this way, nature and good fortune works together to produce these natural marvels. Pearls are created when a foreign body, such as a way-ward food particle finds its way inside the shell of a saltwater or freshwater mollusc. This irritates the inner flesh of the mollusc and it therefore starts coating this particle with microscopic layers of a substance, which we call ‘nacre’, commonly known as ‘mother-of pearl’. Many concentric layers are formed to eventually build up a pearl. This may take many years. For this reason it is understandable that both luck as well as time play a major role in the formation of pearls. When these natural gemstones where first discovered, it was pearls such as these that were taken from mollusc shells. For many hundreds of years pearls have been harvested from oysters and molluscs in streams, rivers and of course, in the sea. Today pearls found on the world market may be divided into NATURAL as well as CULTURED pearls. Pearls falling into these categories may originate from either freshwater or saltwater sources. For approximately the last hundred years human beings have intervened into the production process of both freshwater and marine pearls. The process used in culturing pearls is called ‘grafting’. A small round bead, the ‘nucleus’ which is made from mother of pearl, together with a piece of the frilled mantle of the oyster is placed within the inner layers of the flesh of the mollusc. Thereafter, after being placed back in its liquid environment, the same process wherein the mollusc lays down many concentric layers around the bead commences. Because of the beads size, the time in which the pearl forms is shortened. Although this process produces pearls of similar or even better quality than those formed by nature, it is still unpredictable. Only 5% of all molluscs that are grafted produce gem quality pearls. This makes even cultured pearls rare and valuable. When a pearl is rounder and more ‘even’ or regular in shape than its counterparts, it is of greater value. Baroque pearls have an irregular surface and shape. This characteristic is used to great effect in jewellery as it is generally accentuated and utilized to make up part of the shape of a figurine or animal form. The luster or ‘orient’ of a pearl refers to the ‘inner glow’ of the pearl. This glow is as a result of the light that reflects off the convex mirror-like surface of the concentric layers of the pearl. As it reflects off more than just the outer layer, it seems to glow from within. Pearls also display iridescence. The surface of the pearls is in actuality made up of minute platelets, which act as miniature prisms when light is reflected off them. This gives the well-known play of colors known as iridescence or the ‘mother-of –pearl’ effect. It is important to realize that unevenness in pearls is in actual fact a feature, which indicates authenticity. Immaculate surfaces are however prized highly as it is rare. In most cases, the size of the pearl directly relates to its value. This implies that the greater the size of the pearl, the greater its value. The size of the pearl also corresponds to the time that it has been within the oyster shell. The largest living pearl oyster is the Silver- or Golden-Lipped Pearl Oyster. These oysters are found in the area from the Eastern Indian Ocean to the warm water of the Western Pacific Region. The size of the outer shell varies from 20 to 30 cm. It is from these molluscs that the most sought after pearls in the world originate, namely the South Sea Pearl. These pearls possess an unsurpassed natural luster as a result of its thick nacre. It has a voluptuous velvety shine, seemingly originating from deep within the inner layers of the pearl. In addition to the superior quality of the nacre of these pearls, they grow larger than any other pearls. This is as a direct result of the size of the oyster itself. Pearls generally range from 4 to 8.5 mm in size. Pearls bigger than 10 mm are rare and extremely valuable. Tiny round pearls approximately 1mm in size are known as seed pearls. The value of a strand of pearls is increased substantially if the piece contains pearls that are closely matched according to size, color and regularity of shape and surface. Pearls are today available in many different colors, varying from white, cream, pinks, browns, reds, and greens. Many of these pearls are artificially dyed to obtain such varied tones. In nature diverse colored pearls originate as a result of pigments that naturally exist within the oyster. Natural silver, or ‘black’ pearls are rare and have immense worth. A particular variety of the Silver-Lipped Pearl Oyster produces an extremely valuable black pearl, namely the Black South Sea Pearl. Generally pearls that have been cultured in seawater are of greater value than those cultured in freshwater. This is as a result of the fact that a seawater oyster can only produce a maximum of 2 pearls at one time, whereas freshwater molluscs can produce many more, up to 50. In most parts of the world where natural pearls where previously found, none are now left. Many environments naturally suited to the molluscs that create pearls have been destroyed and all natural pearls that were found in these areas have been harvested. For this reason, those natural pearls that are still available, obtain prices as much as 10 times as high as cultural pearls. When buying pearls, one should be aware of cheap imitations. Plastic, glass or stone beads are sometime coated with finely ground mica or fish scales in an attempt to imitate natural pearls. To identify a natural pearl from a cultivated pearl, the pearl has to be x-rayed in a laboratory. An ex-ray of the inside of a natural pearl will show up concentric circles from the innermost center point of the pearl. The ex-ray of a cultured pearl will however show up the nucleus that was inserted in the oyster in order to initiate the growth of a pearl. It will appear as a round bead/spot in the middle of the concentric rings that have formed around it. The nacre of the pearl is made up of layers of hundreds of microscopic platelets. This gives the surface of the pearl a slightly rough feel. Many plastic or glass imitations may be identified by the fact that this ‘roughness’ is absent. It is believed that by pulling a strand of pearls across one’s teeth, one is able to identify the presence or absence of this slightly ‘rough’ feel. Other characteristics that assist in the authentication of a pearl are temperature and weight. Real pearls feel cold and heavy as if made from stone. Imitations on the other hand are often light and one is not able to detect any particular ‘coldness’. This helps in identifying plastic imitations but is by no means a sure indicator of genuineness. Tanzanite belongs to the crystal type Zoisite. Before 1967 the only gem quality Zoisite found, and therefore the only type used in jewellery, was an opaque pink crystal called Thulite. However, in 1967 a remarkable discovery was made that had a huge impact on the international jewellery trade in years to come. Beautiful blue gem-quality Zoisite crystals where found a 100 kilometers from Arasha in the Meralana Hills in the East African state of Tanzania. This discovery initiated massive interest and excitement among gemstone dealers and experts. When first presented to the jewellery company, Tiffany & Co. in New York not long after its discovery, the experts from this firm immediately recognized the gemstones potential as a great new seller on the international markets. They felt that a new name had to be given to these crystals and so gave it the name TANZANITE. Today these gems are generally by all known as Tanzanite although the gemmologically correct term is blue Zoisite. At the source the crystals were found in greens, yellows, khaki browns and also in an attractive blue color. It was found that when heat-treated, all other colors turned to this beautiful blue color. Many fantastic tales are told of how the first blue crystals, which were found came to be this special shade of blue. Some say that a veld fire caused the crystals to be heated to the right temperature for them to turn blue, and that Masai warriors collected these strange blue stones. Who would ever know if there is any truth is such tales. The truth is however more likely to lie in the fact that some of these stones are heated beneath the earth before hey where found. To this day, Tanzanite is one of the earth’s rarest gemstones, for no other source than this specific site in Africa has been found. Geologists also speculate that there could be as little as a decade’s mining of these stones left in this area. This creates additional mystique around these exceptional stones and as a result buyers from around the world have grabbed at the opportunity to invest in these gems. In South Africa, the Tanzanite Foundation is today the biggest supplier of Tanzanite. This organization has tried to lay down standards according to which the quality of the various stones can be measured. They have set up a ‘Tanzanite quality scale’, which similarly to the classification methods of diamonds, describes the stone’s color, clarity and cut. The color of the Tanzanite is unique and few other gemstones have a comparable color range. (Iolite is the only other stone with a similar shade to Tanzanite, but this is only reflective of the very small or lesser quality Tanzanite crystals.) The distinctive color of Tanzanite is as a result of a characteristic which some gemstones possess called pleochroism. This means that when the stone is viewed from its respective crystal axes’, meaning from various angles, different colors are visible. These colors are sapphire-blue, purple and sage-green. When viewed from the table-surface of the stone, these colors combine to provide an exceptional color. According to the Tanzanite Foundation’s quality standards, the color of Tanzanite is placed into two categories: Blue Violet and Violet Blue. Usually, the color of Tanzanite greatly improves as the size of the stone increases. Bigger stones therefore have a much more intense color and are of greater value. Tanzanites which are more blue than violet (the Blue Violet Qualification) is also generally of greater value because the crystals form with the blue color axis orientated along the width of the crystal and not the length. It is important to take note of the general care of Tanzanite gemstones. Tanzanite crystals are relatively soft and are therefore not ideally used in rings, which are worn as engagement rings or in rings, which are worn everyday. They are suited to use in dress rings, pendants or bracelets. Jewellery incorporating Tanzanite should not be cleaned in an ultrasonic cleaner, as they may fracture. Tanzanite is a unique and valuable gem. Its availability may not be assured for much longer and, apart from its exceptional beauty, Tanzanite’s may be viewed as an excellent investment opportunity. In symmetry lies the promise of superior genetic material, which humans ultimately relate to the promotion of the survival of their specie. This might explain why we as humans also equate beauty and attraction with symmetry. Keeping this in mind, one might ask what, among all other things, can be more indicative of a sense of integral symmetry than a perfectly formed crystal? Maybe it is for this reason that gemstones are generally seen as the perfect accompaniment to the human body. Human beings’ age-old fascination with crystals and their intrinsic beauty have created the need within human beings to associate these objects directly with their bodies. The gemstone industry has therefore, since the original interest in gems, walked hand in hand with the jewellery or goldsmithing industry. To enhance the wondrous beauty of a natural crystal, the success of the design of that which encase it, and enable it to be worn, rests greatly on the designer’s ability to create harmony and balance within the design of the jewellery piece, which envelop the gemstone. The design process cannot possibly be described as a purely rational thought process. At the same time, it consists of necessary elements of development. Before the start of this process the designer needs to know within which boundaries he or she is working; in other words which restrictions are placed upon the design. Thereafter, an open and active imagination becomes the designer’s best tool and friend. Now the designer can place rough ideas to paper, which is then repeatedly refined until the desired visual effect of the design is combined with a practical understanding of its construction and workings as well as the production processes that will be used to manufacture it. This is achieved through careful negotiation between the pleasing visual components of the design and the practical or useful and manufacturable elements, which includes the needs of the client or target market for which the designs are produced. Eventually final renderings and technical drawings are made of the piece before it is produced. When the designer is given a specific requirement to work with, such as working with a specific gemstone, which in this case would be Tanzanite, it is essential for him or her to fully comprehend the gemstone’s own restrictions. This is taken into account, as it might restrict the size, function or the wear-ability of the jewellery piece and therefore also ultimately the type of jewellery piece manufactured. In the case of Tanzanite, the stone’s relative softness causes the stone to possess a relatively poor resistance to scratching, breaking and chipping which therefore restricts the way in which it can be used. Tanzanite is therefore far more useful as a gem used rather in neck pieces, earrings and brooches, than in rings that are worn on an everyday basis such as engagement rings. 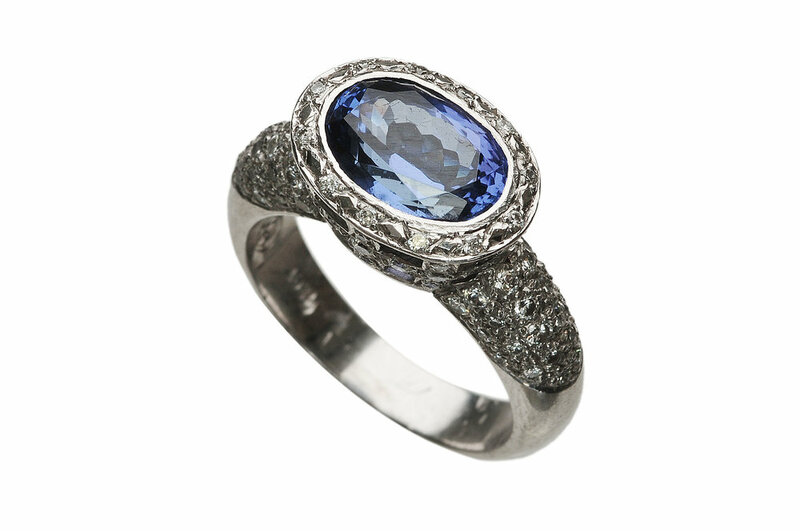 There is however a lot of dress-rings containing multiple carat Tanzanite stones on the market today. These are supposed to be worn as dress- rings only and are not meant to be worn everyday. Tanzanite is found in big, clear crystals and is therefore ideal for large dress pieces, especially neck pieces. The beautiful violet-blue color of the gemstone is most prominent in bigger stones, which makes it suitable for larger pendants and drop earrings. Stones are also marketed in a wide range of convenient cuts and sizes, which gives the designer greater freedom of choice. All of these factors guide the designer in her or his design choices. As a result of Tanzanite’s relatively recent appearance onto the world market, it is marketed as a gemstone, which is fresh, new and modern. According to this, it carries the image of being classic and get modern, simple and elegant and jet fresh. Its color is especially well suited to the color of white gold and platinum, which has in recent years become increasingly popular as a medium in which to set valuable gemstones. This encourages its modern image. Tanzanite can also be used to great effect alongside white diamonds. From a manufacturing jeweler’s point of view, the use of these stones can sometimes be problematic. No intense heat should be brought near to the stones as they may shatter. This makes the repair of jewellery very difficult and makes the re-sizing of rings impossible if the stone is not first removed from its setting. Tanzanite should also never be put into an ultrasonic cleaning instrument as the stones may crack. As Tanzanite is relatively rare as a gemstone, a thousand times more rare than a diamond, the inclusion of it into a piece of jewellery should be considered with much care. When acquiring a gem of such value, one would want the design of the setting to complement the rarity and the uniqueness of each stone. This is even more relevant when using larger gemstones of great value. The design and the elegance of the metal constructed around the stone should be unique and timeless, enhancing the gems rarity and preciousness. The piece of jewellery, which incorporates this beautiful unique stone, should be able to be passed on to further generations, remaining fresh and relevant. You have reached that moment in time when your heart is beating in your chest because you know you are going to pop the question any time soon. And now you realize that the next step is to get hold of that glittery thing that fits on her finger, the engagement ring. But it cannot be any old ring, it must be a ring that will put a sparkle in her eye that will sweep her right off her feet. At this point it will perhaps be a good idea to calmly face the facts. Not just emotionally, but financially this is going to rattle you. If you had a figure in mind you will most probably have to rethink it once you are more clued up as to what precious jewellery really cost. And remember…it does not happen every day, so it will be worth your while splashing out. First of all it is important to find a jeweler that you can really trust. Avoid places where you feel like ‘just another customer’. Demand personal service – this is a big purchase with a lot of emotion connected with it. Whether you are buying it alone to be a surprise, or whether you and your partner are going through the process together, you must be happy with your purchase. Honestly, the best way to buy her an engagement ring she’ll adore forever is to let her pick it out herself. Modern woman are confident in their personal style and they know about jewellery. This is a ring that she will wear every day and she has to feel comfortable with it. It has to fit her lifestyle. A good jeweler will be able to assist you with the many aesthetic and technical/practical aspects involved in buying such an jewellery piece. They will be able to assist you with all the aspects of the design, from the stones used, the actual setting to the metal choice, and then make all the elements fit within your budget. If you are the ultimate romantic and determined to surprise her, there are a couple of options to consider. First you have to pinpoint her taste. There are various ways of sussing what she likes, take note of what she says and shows you. If you pass by a jewellery shop look into the window and comment on any item, listen to her response and start a conversation around it. Women tend to throw subtle hints once a relationship is at the point where getting engaged would be the next step. What she wears, her favorite fashion label, even her taste in household items are good points of departure and any good jewellery designer will be able to assist you in drawing together all these elements to create a magnificent design that will suit her personality. Many guys get a token ring made with the stone, which they have chosen for the final ring. This way, the style of the ring can be changed later according to the girl’s wishes. This can however be costly, because even though the material in which the first ring was made was most probably inexpensive (e.g. sterling silver), the labor costs are the same as with expensive materials such as gold or platinum. Some men decide to only give a loose diamond or gemstone as the surprise so that the she can decide on the style of the setting later. Why a diamond? does size count? Nobody has determined that diamonds should exclusively be used in engagement rings, and yet these stones are without any doubt the most popular choice of any gemstone used in these special token jewellery pieces. There are however some real and justified reasons why this is so. Diamonds are unique. They are the only gemstones found beneath the crust of the earth and are produced under extreme conditions and extraordinary pressure. They are the hardest of all gemstones, which make them ideal for everyday wear. And then, they are off course exceptionally sparkly and beautiful. If you have ever thought that women don’t compare their ‘bling‘ with that of their friends and that they are not familiar with the info around diamonds, you are fooling yourself. And I am afraid to say this, but for many woman size does count. But do not let this dishearten you. You can maybe go for a good quality stone rather than concentrating on the size, as no girl will say no to a diamond as long as it is beautiful and in a lovely setting. When you understand how the 4 C’s influence the hugely varying price of diamonds, you will be better equipped to make a choice as to size vs. quality. All of these aspects affect the value and beauty of a diamond. This is a basic description of how diamonds are graded. There are many other more refined characteristics that come into play when evaluating a diamond, but these become quite technical. This refers to the weight and therefore also the size and value of the diamond. Diamonds less than 1 carat become progressively more expensive, but as soon as you go over 1 carat the price jumps up considerably. This is because diamond material big enough to cut a carat stone or bigger from is must harder to find than that from which smaller stones are cut. A popular size of stone is anything from 0.5ct to just over 1 ct. The clarity of the stone refers to the grade of flawlessness of the material from which the stone is cut. It evaluates the severity, size, visibility and amount of flaws of a particular stone. Flaws (or often called inclusions) may have an impact on the beauty of the stone. Stones with a significantly reduced clarity level may seem dull as light is not reflected correctly or dark eras may be visible. Flawless is fantastic, but unnecessary and very rare and costly. If you can afford a stone in the VVS and VS ranges great. However it might help you to know that the inclusions (flaws) within any diamond of SI 2 and upwards can only be seen under 10X magnification and not with the naked eye. The whiter a diamond the more it is worth. The color of a stone is plotted on an alphabetical scale, which starts at D (the best color available). From there the color becomes more yellow as you proceed down the alphabet, although these diamonds are still all classified as ‘white’ diamonds. Other natural colored diamonds (not classified in this way) such as diamonds classified, as having ‘fancy’ colors can be staggeringly expensive because they are very rare. Light brown diamonds, called champagne or cognac diamonds and black diamonds are also available and are reasonably inexpensive in comparison to white diamonds. A good general color for a white diamond is anything in the region of F-G-H. Many white diamonds up to I will still appear reasonably white. Below J the yellow tinge of the stone becomes quite apparent. The cut of the diamond determines how well it reflects the light that travels through the stone. The angles at which the facets of the stone is cut, has a great influence on this. A stone can be cut too deep or too shallow which means that the light travels through the stone and out through the bottom. This means the stone looks dull and does not sparkle in the way it should. There are many different cuts of diamonds and other gemstones. The most popular cut for an engagement diamond is still the Round Brilliant Cut. This cut is optically the most brilliant. In other words, the cut allows light that to be dispersed in best way creating the best sparkle. Other cuts include the emerald cut, which do not create the same “fire’ or sparkle, but are nevertheless beautiful. Other cuts include princess cut, marquise cut, oval etc. Each cut has its specific pros and cons. It is important to look at a wide variety, whether a design is created around the stone, or whether the design guides the use of certain stone shapes. It is important to trust the jeweler from who you are buying. With all the technical information surrounding diamonds and their grading systems, you have to be sure that you are getting that which you are paying for. Most reputable jewelers will only sell certified diamonds which mean that each diamond comes with its own ‘passport’. No two diamonds are the same and this document or certificate describes the stone’s uniqueness through its technical data. This ‘fingerprint’ allows you to at any time have the stone in your possession compared to the information on the certificate. Now you have to decide in which metal the beautiful stone you have chosen will be set into. The karat of the gold refers to the pureness of the gold, in other words the percentage of pure gold contained in the alloy used. Pure gold is too soft to use in commercial jewellery purposes. 18 Karat gold is ideal for this purpose. It is hard enough, beautiful and durable while containing a high enough gold content to give it true intrinsic value. 18K Yellow gold is quite a traditional choice, but can be used successfully depending on the specific design. Rose gold has a beautiful reddish hue. It is very fashionable at the moment and can be used with great success in conjunction with gemstones which has a warmer color such s champagne or cognac colored diamonds. 18K White gold is a popular choice at present as it conveys a fresh modern feel while still being romantic. Its color, which is warmer in tone than platinum, works particular well with white diamonds. White gold is an alloy of pure gold and at least one other white metal, usually nickel, manganese or palladium. It has to be plated with rhodium to give it a bright white color. Platinum has a steel blue-grey overtone and never need to be plated. It is however not harder than white gold as many people think. It is however less malleable than gold and is therefore a good choice for prong settings as the setting are less likely to ever bend open. Designing the ring can be a rewarding part of the process as this is when you (and/or your partner) can install your own individual style onto the ring. A good designer/jeweler will often intuitively know which styles you prefer just by asking the right questions and they will guide you in the technical limitations as well as the styles suited to the lifestyle of your fiancée.